Dr. Klonsky is professor in the Department of Psychology at the University of British Columbia. 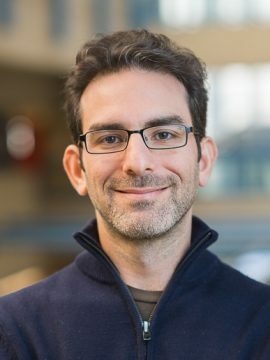 His research examines suicide, including the pursuit of parsimonious models of suicide and better understanding of suicide motivations and warning signs. Dr. Klonsky also pursues research interests in emotion, personality, and assessment, many of which overlap with his work on suicide. Research interests include suicide, emotion, self-injury, impulsivity, borderline personality, clinical assessment, integration of psychological science and practice. Klonsky, E.D., *Saffer, B.Y., & Bryan, C.J. (2018). Ideation-to-action theories of suicide: A conceptual and empirical update. Current Opinion in Psychology, 22, 38-43. Klonsky, E.D., *May, A.M., & *Saffer, B.Y. (2016). Suicide, suicide attempts, and suicidal ideation. Annual Review of Clinical Psychology, 12, 307-330. *May, A.M. & Klonsky, E.D. (2016). "Impulsive" suicide attempts: What do we really mean? Personality Disorders: Theory, Research, and Treatment, 7, 293-302. Klonsky, E.D. & *May, A.M. (2015). The Three-Step Theory (3ST): A new theory of suicide rooted in the "Ideation-to-Action" framework. International Journal of Cognitive Therapy, 8, 114-129. Tolin, D.F., McKay, D., Forman, E.M., Klonsky, E.D., & Thombs, B.D. (2015). Empirically supported treatment: Recommendations for a new model. Clinical Psychology: Science and Practice. Klonsky, E.D. & *May, A.M. (2014). Differentiating suicide attempters from suicide ideators: A critical frontier for suicidology research. Suicide and Life-Threatening Behavior, 44, 1-5. *Victor, S.E. & Klonsky, E.D. (2014). Correlates of suicide attempts among self-injurers: A meta-analysis. Clinical Psychology Review, 34, 282-297. Klonsky, E.D., *May, A.M., & *Glenn, C.R. (2013). The relationship between nonsuicidal self-injury and attempted suicide: Converging evidence from four samples. Journal of Abnormal Psychology, 122, 231-237. *May, A.& Klonsky, E.D. (2013). Assessing motivations for suicide attempts: Development and psychometric properties of the Inventory of Motivations for Suicide Attempts (IMSA). Suicide and Life-Threatening Behavior, 43, 532-546. *May, A.M., Klonsky, E.D., & Klein, D.N. (2012). Predicting future suicide attempts among depressed suicide ideators: A 10-year longitudinal study. Journal of Psychiatric Research, 46, 946-952. Klonsky, E.D. & *May, A. (2010). Rethinking impulsivity in suicide. Suicide and Life-Threatening Behavior, 40, 612-619. View Google Scholar profile and citations. Dr Klonsky is currently not accepting graduate students.